Deciding to guide students in becoming podcasters and sharing their work is, in my mind, an easy extension of what happens naturally in our language classrooms. The purpose of language is communication. We become better communicators through practice, repetition, and feedback. Podcasting formalizes lots of those natural dialogues. When I started working with my students at Niitsitapi, we needed a way to record and share the stories so they lived beyond the walls of our classroom and into every classroom in our building and podcasting seemed like a natural place for this work to happen. What does it mean to be a story teller? What are the elements of a good story? For the purposes of the first foray into podcasting, there was some freedom for students in knowing that honouring traditional stories meant not making changes or additions to the story. Telling was retelling. And becoming familiar with the elements of a good story gave students confidence to write their own stories and plus the work later. As the work passed into the second year, it grew from retelling traditional stories to plussing them with many sides. A multi-sided story that includes both science eyes and traditional perspectives. Kids were hooked. We brainstormed all of the many sides that might be important to telling our story. Once you have the why down, the how is pretty easy. Finding recording space in busy, noisy schools can be challenging. 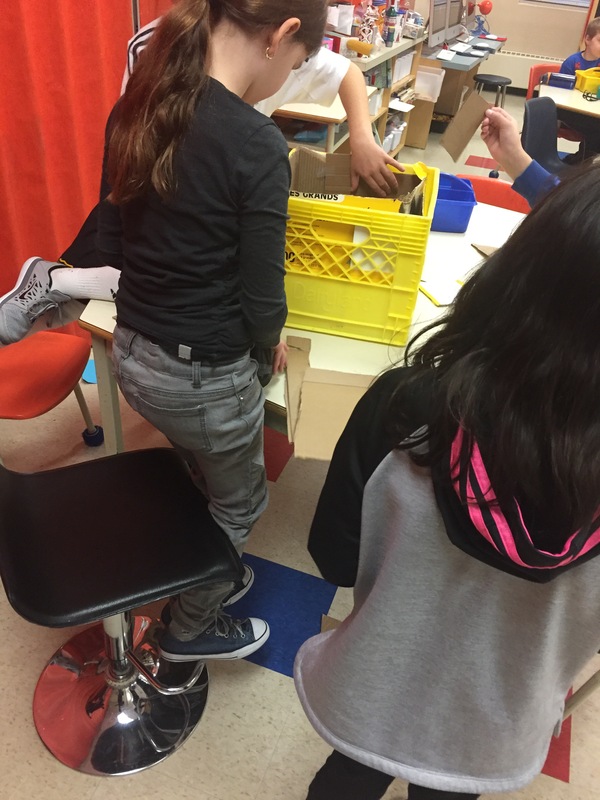 I found that a quiet corner in the classroom works just fine and, in the end, we adapted our puppet theatre to be the large “box” and insulated it with blankets. I left the upright pipes unchanged, mostly because I didn’t want to buy new joints. If I were designing from scratch I would likely make a few modifications but sometimes design constraints are a good thing. Mostly successfully recording is about teaching students to respect one another in the classroom; if one group is recording the others need to be next to silent. 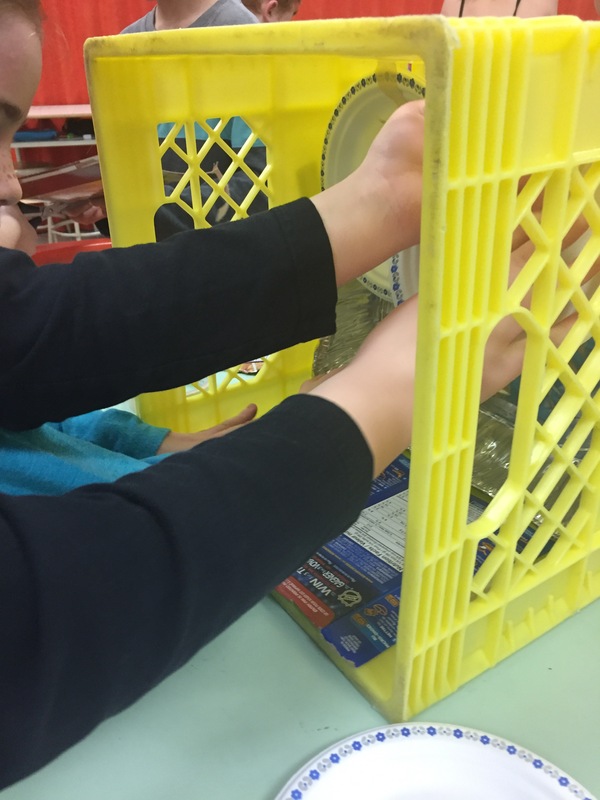 Milk crates stuffed with soft materials was an excellent exploration of a science unit in hearing and sound and make darn good mini studios. Listen to podcasts and determine elements of a good podcast using kid-friendly podcasts as “mentor texts”. We looked at the types of podcasts and most decided on one or two voices in a conversation, retelling the stories learned. The amazing team over at Tumble Podcast accepted a Skype session with my students and discussed what makes up a good podcast and offered support on technical elements of recording. One of the tips we liked best: record in a place with lots of “stuffy soft things”. I had students use this format to organize their thinking for the introduction and this to write the script. Some of my work in another lifetime is in writing for film and television, so I was kind of winging it here with how to write an official podcast script. I showed students examples of my scripts and we discussed the elements that made them “good”. We looked at samples of scripts including this. Finally, I made up my own version of what I wanted it to look like to help organize their work. The class divided into teams and each took on 1-2 elements of the topic. They researched and brainstormed using a concept web, which they turned into a rough draft. The final draft is a colour-coded script where each student has highlighted their lines with a different colour. I used the Blue Yeti mic to record my work as a part of my masters in educational technology, so I figured that if it was good enough for that work it was good enough for the classroom. We paired it with garage band on the macbook pros at school. Even this much is not necessary, though… there is absolutely nothing wrong with the production quality you’ll get out of an iPad or iPod in a room with decent acoustics. After recording, it’s time to edit the audio. I like Garageband for putting things together but find that it’s tricky for young students to do without one-to-one support. If you have time available for it then I’d say go for it and make it fancy… if not, there is nothing wrong with a simple voice recorder on your smart device and hitting pause and record as needed. If you choose to add music be sure to use podcast friendly music and credit the creators. Good habits are important to instill in our students. We chose to publish our podcast to Soundcloud and place a link to it on our classroom Website and Twitter feed rather than creating an RSS feed and publishing to iTunes, which, I guess means we’re not an official podcast, but with a budget of zero dollars and when this gives us access to everything we needed as school-based podcasters, this fit the bill. The love of being an author and storyteller is a delicate plant that needs to be nurtured for kiddos. A little praise, a little space for taking risks, a little nudge towards improving the next draft. They’re enjoying the work for now and I can’t wait to share the next iterations.